The news is that the boy honed his soccer career at a most unlikely place – the church, specifically the Synagogue Church Of Nations, where he is top striker with My People FC, a football club owned and funded by the church's General Overseer, Prophet T.B. Joshua. Emmanuel has since returned to the Synagogue where he lives. And last Sunday 22nd November 2009, he set thousands of parishioners into rapturous celebration as he stormed the sanctuary for a thanksgiving session. Former Zambian president Frederick Chiluba was among other eminent persons that rejoiced with Emmanuel, who dedicated his awards to Nigeria's rising army of suffering youth, pledging to start a foundation that would help them become useful and influential members of the society. Many wept for joy as the golden boy, who currently plays for Boden BK Football Club's junior team in Sweden, narrated his rag-to-riches story. His father, Sani Unakhasor, from Edo State, was among the weeping crowd, and he too wept like a baby. His tears were both of joy and intense sorrow. Joy for his son's success and deep sadness over the tragedy that brought him, and later, his son, Sani, to the Synagogue. Though not rich, Unokhasor, a father of nine, and husband of two wives, was enjoying life in his little corner until tragedy struck. One day, a hot argument burst out between both women, and in a fit of madness, the junior wife, who was then nursing a three-month-old baby, took a bottle, broke it and stabbed her senior colleague in the throat. The senior wife bled to death before she could reach the hospital. With one wife in a hospital morgue and another in detention for murder, Unokhasor's life took a spin. There was an uncontrollable chaos in his family. Nothing he did ever worked. He could not cater for his children, and two of his daughters got married out of frustration. He wanted to commit suicide. He almost did, until he met Prophet T.B. Joshua. Well, as they say, the taste of the pudding is in the eating. “My name is Sani Unokhasor. I'm form Edo State. I'm a widower. I married my first wife with happiness. We had no problem with child bearing when we got married. We had our first issue, a girl. The second one, too, is a baby girl. The third and the fourth are girls. I was confused because I'm the only son of my father. And my father is an old man. Well. I started worrying (about not having a male child). That's what made me to go and marry a second wife. But as God would have it, my first wife took in before the second, and she gave me my first baby boy. “Now, my junior wife was nursing a baby, she went to prison with the baby. The baby grew up inside prison. She spent three years there. Then, they asked me to come and take the baby. I took the baby home and began to nurse him. I suffered a lot to see that he survived. The problem was so much I decided to kill myself but I couldn't do it. I felt that if I did it, who would take care of my children? That's what made me to be patient. And I started suffering with them. Out of frustration, I gave out two of the girls, who were about 20 years old, in marriage. They married out of frustration and I continued to battle with the rest. Some of them couldn't go to school again. They dropped out. At the height of Unokhasor's extreme suffering, he found The Synagogue, through his son. Prophet T.B. Joshua restored him with an unspecified amount of money and Sani Emmanuel, whose mum was stabbed to death, had found comfort in the hollows of Joshua's hands and had become an altar boy, living in the church and, for the first time in a long time, enjoying the world. Later he became a member of Joshua's football club, My People FC. Sani Emmanuel's first invitation to the Golden Eaglets' camp wasn't quite successful. He was among others. But while his fellow decampees were sad and forlorn, the striker, who was born on December 23, 1992, moved on as if nothing happened. He even encouraged a teammate, Onazi Ogenyi, and took him to Joshua. Joshua counselled them and restored their hope by sending them to Boden BK Football Club's junior team in Sweden. They excelled and eventually earned another invitation to the Eaglets' camp. They made the team that won Silver in the U-17 championship that ended two weeks ago. 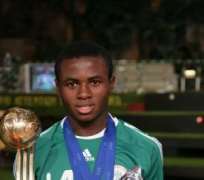 Onazi Ogenyi, Sani Emmanuel and Dami Paul, the Eaglets' goalkeeper, were celebrated at the Synagogue last Sunday.